Chalk lettering on an often-erased chalkboard is the visual theme of Chalkboard style. The chalkboard background art itself is made of a rich four-color build to give it depth and richness. Tiny flowers and leaves emerge from above and below the main type, which is a hand written all capital letter style that looks much like handwriting in chalk. The supporting fonts are a classic script font, plus a simple and graceful sans serif font with all capital letters. A graceful, small swirl divides the text, and a simple and elegant border of dots, completes the look of this style. 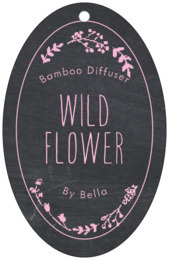 Customize your Chalkboard bath and body tags today! 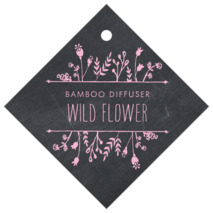 Chalkboard bath and body tags are printed on one side and are blank white on the back. You have the option to add text on the back for a small charge—just ask! Bath and body tags are printed on extra-thick cover weight white paper and come in a variety of shapes and sizes, including square, circle, heart, a scallop-edged circle, ovals, and other shapes. Bath and body tags come pre-punched with a small round hole to thread your choice of tying material. They are punched out individually and packaged as a set in small bags. 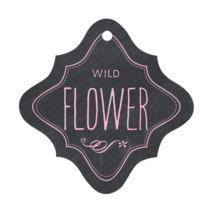 Just choose a shape from above and then select "Personalize" to create your custom Chalkboard bath and body tags.